Jeremy Corbyn’s EU Fudge may make a hard exit far less likely, but how do I pitch my Brexit gags now? On 10 May 2016, in the closing days of the Brexit campaign, at an impromptu speech in Cornwall, lying Boris Johnson again invoked the Brexiters’ foundation myth that the EU sought to ban bendy bananas. But voters who backed leaving the EU in order to get back the bendy bananas, which had not been taken off them anyway, must surely now be wondering, privately, if it was all worth it. Apparently Corbyn’s Own Brexit Fudge ™ ® was offered to preserve the soft Irish border with Northern Ireland, as it will be impossible to re-bend a straightened Euro banana should a straight Irish banana need to cross into Northern Ireland, perhaps as part of an Irish child’s snack box, an Irish chimp’s dinner or as an Irish clown’s comedy prop. Some Tory Brexiters have an almost blind faith in the idea that there may be some form of as yet nonexistent technological solution; Bernard Jenkin, interviewed by an increasingly scruffy Dobby the House Elf on Newsnight on Tuesday, said Wilf Lunn, the extravagantly mustachioed novelty bicycle inventor from Vision On and Magpie, was already working on a bespoke Border Banana Detector and Straightener ™ ®. Lunn’s Borderbananandetecto-straightorbendomatic ™ ® would detect and straighten, or bend, any bananas crossing the border, so they would be the right banana type for the segment of the Irish island they were bound for. Jenkin’s attempt to demonstrate a prototype Borderbananandetecto-straightorbendomatic in the Newsnight studio backfired spectacularly after it lunged at political editor Nicholas Watt’s face and tried to peel it. But Corbyn’s Own Brexit Fudge ™ ® is as impossible a proposition for the EU in its own way as Boris Johnson’s pre-referendum fantasy of the magic cake that grows again, no matter how much of it you eat; an idea the massive liar surely gleaned from a visit to one of the cloud lands at the top of the Faraway Tree, before sliding back down the slippery slip with his friends Darius, Marina, Petronella, and the Saucepan Man. Whether you are a kamikaze-hard Brexiter or a diehard traitor Remoaner, the precision-applied works spanner of Corbyn’s Own Brexit Fudge ™ ® means hard Brexit is far less likely. Banzai! 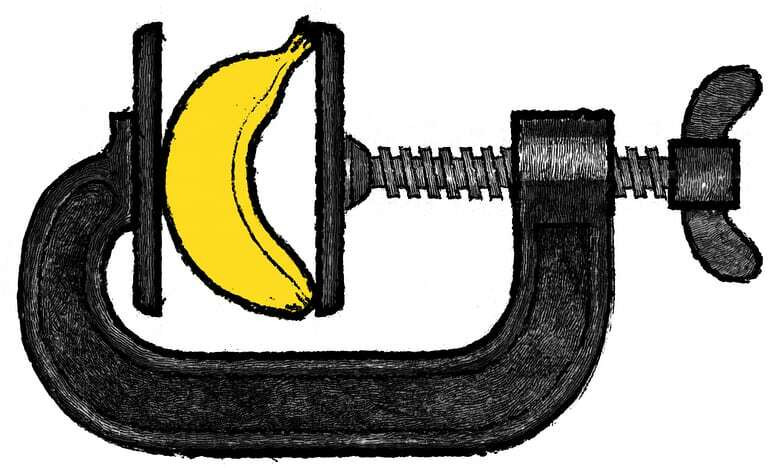 Boris Johnson’s dream of bendy bananas for ever withers on the banana vine, a cowed people cowering for eternity beneath the blow of the straight banana, a straight banana squished on a human face – for ever. But the culture war continues. While I never knowingly eat doughnuts, “lashing out at an indifferent public” is a reasonable description of the impression I strive to create live, and detractors often inadvertently illuminate exactly the effect I aim for, their harshest criticisms helping me to sculpt the on-stage character of Stewart Lee. But as I stood, on the 194th date of my current 220-date tour, on stage in Dartford last Sunday, in the first half-full theatre of the run, my hyperacoustic ears still ringing from a catastrophic sound operator error at Hereford Courtyard on Thursday, the room somehow just would not quite catch fire. I wondered if Mad Max McCarthy was right. Was it indeed “end times for the Roy ‘Chubby’ Brown of the Oxbridge comedy establishment”? n April last year, the Daily Telegraph, the Daily Mail, the Daily Express, Breitbart, the Spectator, ShortList and Spiked all ran the same demonstrably false story saying I was experiencing mass walkouts because of doing anti-Brexit jokes. This wasn’t the case, even in archly Eurosceptic Lincoln, although, to be fair, the people there may have struggled to find the exits without hard-working east Europeans to show them the way and carry their cauliflowers around. The only walkout of the tour was a very funny man in Canterbury, who shouted “I’ll wait for the DVD” as he left, but I don’t think his departure, unlike David Cameron’s, was Brexit-related. Last year it was fun doing anti-Brexit material on tour. Brexiters in the room had won the referendum, after all, so as a Remoaner I was in a position of weakness punching up at them, as the comedian is required to be. Laughing Brexiters would come up afterwards and magnanimously get me to sign their books and DVDs “to a Leave-voting c*nt”, an amusing transaction that genuinely renewed my faith in humanity nightly. We could all be friends after all. But on Monday, after Corbyn proposed his hard Brexit-sinking “bespoke customs union”, it seemed like no one was going to get exactly what they wanted out of Brexit now. There probably weren’t any winners, certainly not the Leave voters of Leave-voting Dartford, now condemned, even their figureheads agree, to an even less prosperous future. So on stage in Dartford, I didn’t feel I quite understood how to pitch the Brexit stuff any more. In a situation where no one will win there were no winners to aim at. It was not clear any more which way was up, and I no longer knew which direction to punch upwards in.